Daredevil #10, Page 12. 2012. Ink(ed by Joe Rivera) on Marvel board, 11 × 17.25″. Digital color by Javier Rodriguez. "I've got some dirt on my shoulder, could you brush it off for me?" (Technically, it's diamond dust.) 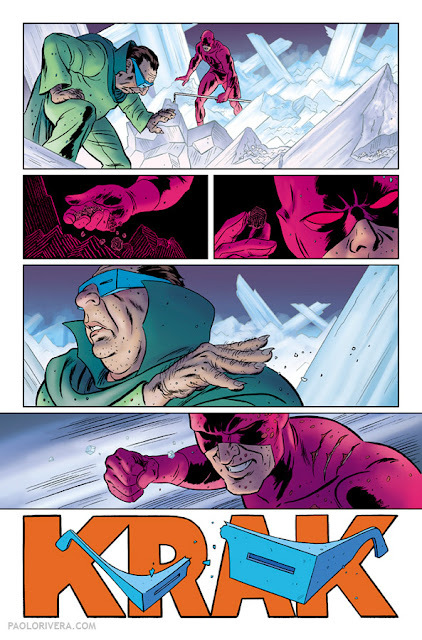 Daredevil knocks Mole Man out cold in this sequence from their epic staff fight in issue 10. 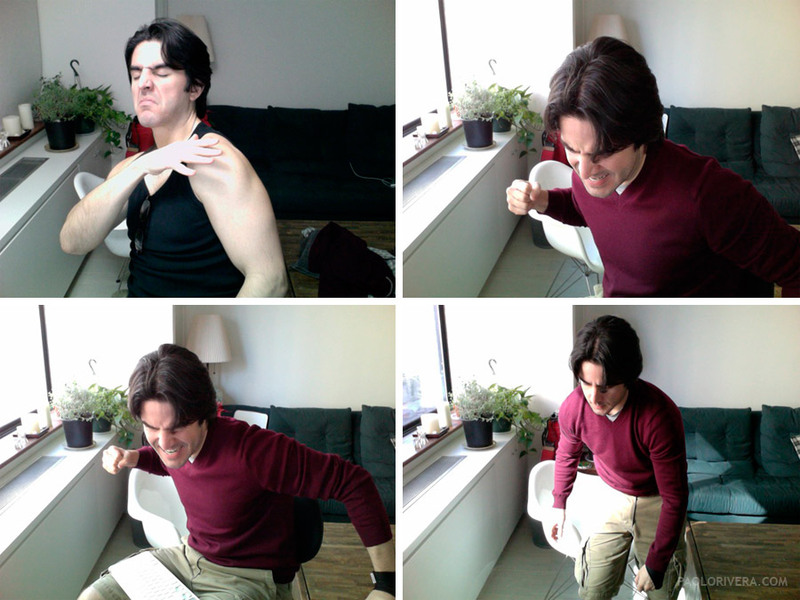 I've been using Photobooth almost exclusively for photo reference—no more tripods or delayed shutters—I just keep my wireless keyboard on my lap and hit enter when I like what I see. Of course, when posing as these sightless combatants, I like to close my eyes to achieve more authentic gestures. My layouts are completely digital now, drawn on a Cintiq. I keep the gutter-background off-white to distinguish it from the panels, each occupying its own layer. 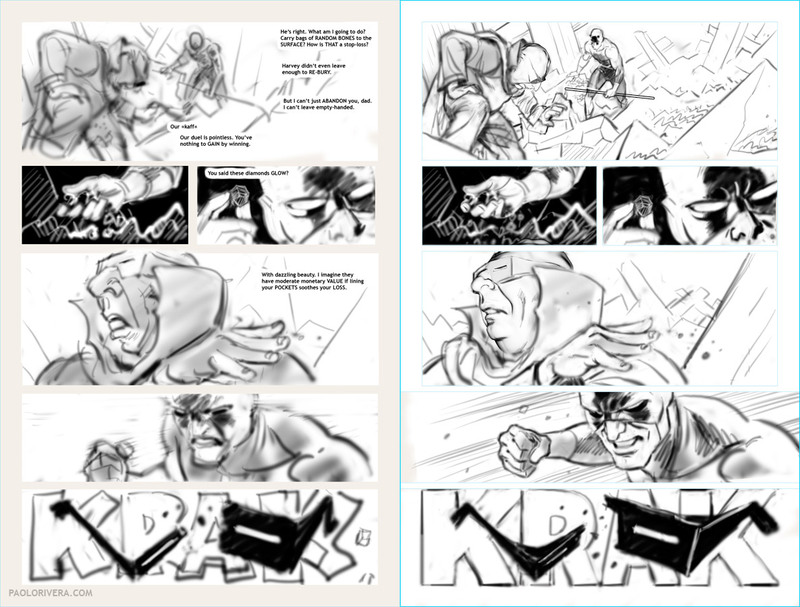 The layout is what gets sent to my collaborators for approval, so I include the dialogue (this also helps me to organize my thoughts when facing a blank page). 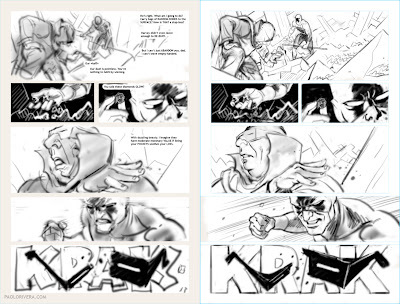 The digital composite tightens up the drawings, incorporating borders, perspective guidelines, and 3D models, if needed. Starting with this issue, I drew the "radar panels" in pencil alone, saving my dad from needlessly tracing each and every wire-form line. The negative image of my pencils is printed in black (along with the black borders) on the blue-line page my dad then inks. 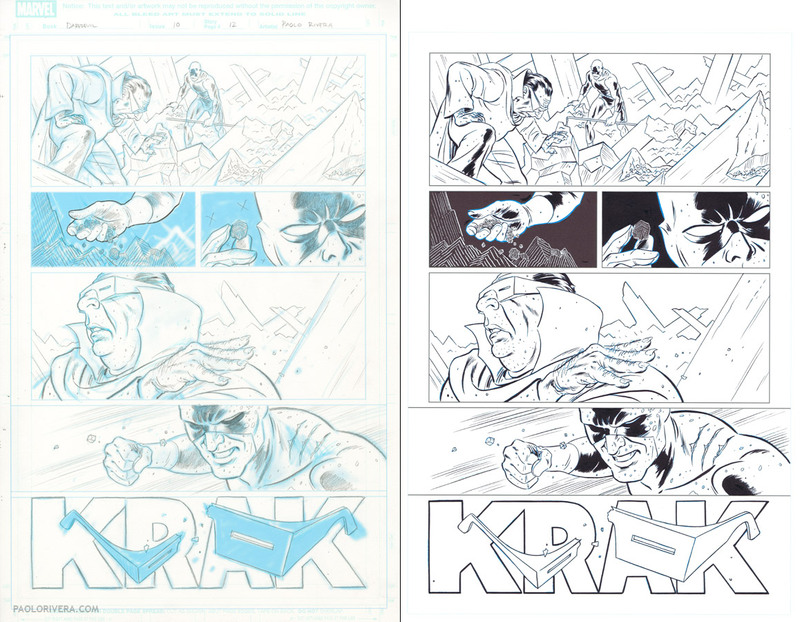 This leaves the original art looking a little more like the published page.